A Mariner East 2 construction site in rural Pennsylvania. The Public Utility Commission lifted a ban on construction of a valve, removing one obstacle to completion of the troubled project. Mariner East 2 construction site on Shepherd Road in Edgemont Township, Delaware County. A new report says the pipeline construction could generate $9 billion in economic benefits for the state over six years. The Mariner East pipelines and related plant could have a potential $9 billion financial impact in the state over six years, according to a report by the firm Econsult Solutions. Sunoco/Energy Transfer Partners, which is building the $2.5 billion pipeline, paid for the report. It analyzes the economic benefits of the Mariner East 1, 2, and 2X pipelines that will carry natural gas liquids from the western part of Pennsylvania and eastern Ohio about 350 miles across the state to a processing and export facility in Marcus Hook, Delaware County. The report, published Monday, comes less than a week after the Department of Environmental Protection shut down a large part of the construction on the Mariner East 2 following months of continued permit violations and damaged waterways. It uses project budgets and standard modeling to forecast potential economic benefits, including spending and employment, between 2014 through 2019. The report does not factor in social and environmental costs, or potential loss of property values. Mullin said the $9.1 billion impact is very high compared to most large projects in the state. He said reports like these are useful to policy makers, but said they are only part of a larger story. Mullin said these types of reports stay away from including any costs that could be considered value judgments. Some economists criticize that approach, saying it shows only one side of the coin. Haynes Goddard is a retired environmental economics professor at the University of Cincinnati and an expert in cost benefit analyses, which include calculations of social and environmental costs of large projects. Goddard said this type of report is meant to “buck up politicians” who support the project and the company that stands to make money off it. “They’re really ultimately misleading because they’re a very incomplete analysis of all the economic impacts positive and negative that these kinds of projects could have,” Goddard said. The Mariner East 1 pipeline, which primarily consisted of reversing the flow and transporting NGL’s instead of gasoline, is already operational. Both the Marcellus and Utica Shales produce natural gas liquids, which include ethane, propane and butane. A fractionation plant separates the hydrocarbons after they travel through a pipeline, and one has been built on the former 800-acre refinery in Delaware County. The 20-inch Mariner East 2 line has been under construction since last winter. The third line, the Mariner East 2X, is an additional 16-inch line in the planning stages that would run parallel to the Mariner East 2. The company also has plans to boost the fractionation facility at the Marcus Hook Industrial Complex, which has been dubbed the Revolution Project. 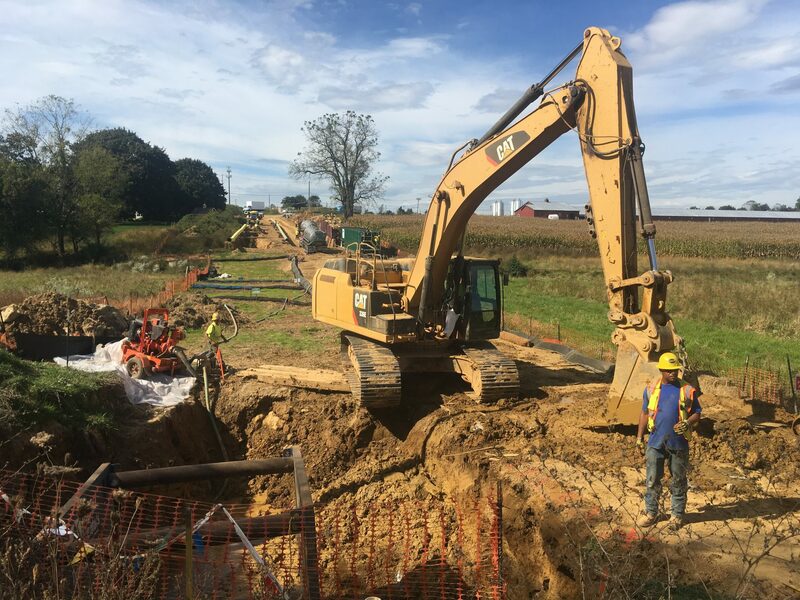 The Revolution Project includes 110 miles of new gathering pipelines in Butler County, along with 20 miles of an existing 16-inch gathering pipeline. Combined, the gathering lines will carry 440 million cubic feet of NGLs a day to the larger pipelines and on to the expanded plant in Delaware County. The report says the majority of economic gains will occur in Philadelphia and its suburbs. It includes direct, indirect and induced employment impacts, which the report says totals 57,070 jobs earning $2.7 billion over six years. The majority of directly related jobs are in construction — 5,240. A Sunoco spokesman said about 2,500 people are employed building the Mariner East 2. Indirect jobs would include those working in the pipeline supply chain — making the steel pipes, for example. Induced jobs are even less direct, and includes those who may work at a pizza shop selling slices to construction workers. The report says Chichester School District, Marcus Hook Borough, and Delaware County together will gain an additional $7.1 million in yearly tax revenue from Sunoco/Energy Transfer Partners. Eric Friedman, a homeowner who lives along the route in Delaware County and has been fighting Sunoco over an eminent domain taking, criticized the report for looking simply at the financial benefits, and not taking into consideration the risks to public safety. Natural gas liquids are highly explosive. If a pipeline leaks, the liquid becomes a colorless, odorless gas. He and other opponents have been pushing Governor Wolf to do a risk assessment. “Even if the economic propaganda is true, I don’t think it offsets the risk to public safety,” he said.